When it's displayed frequently, one particular facial expression which should always send up a red flag. What facial components make up this expression? Both the elevated CFC and the partial mouth smile must be present together. 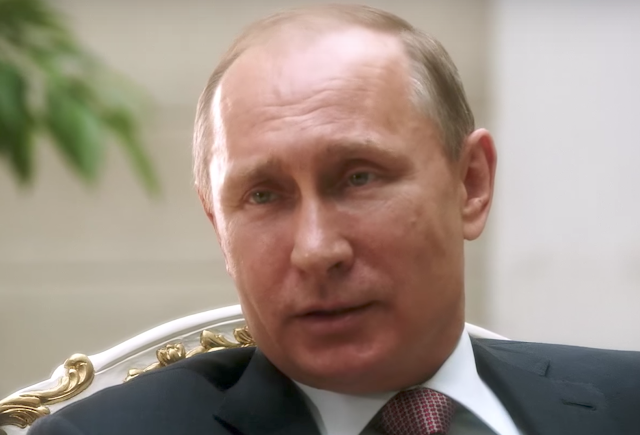 In the above promotional video of Oliver Stone's "The Putin Interviews", during 0:36 - 0:38, at the end of the sentence, "Suffice it to remember the Rosenberg spouses who were electrocuted", Vladimir Putin displays this precise cluster: his central forehead elevates, his mouth configures in a partial (suppressed) mouth smile, and his upper eyelids are partially closed (see image below). In this context, this expression overlaps with the phenomena of what is known as "Duping Delight" - indicating that President Putin takes pleasure in the Rosenberg's execution (Julius and Ethel Rosenberg were United States citizens. After being convicted of committing espionage for the Soviet Union, they were executed. Coincidentally, their deaths occurred sixty-four years ago tomorrow - June 19, 1953). Contempt and arrogance are emotions which are overlapping in nature. It's also very important to note, that all three of these emotions can be displayed by way of other facial expressions. Summary: When a person displays an elevated central forehead contraction together with a partial (suppressed) mouth smile - and does so frequently, this has very high correlation with sociopathic behavior (Antisocial Personality Disorder). Nonverbal Communication Analysis No. 3760: Rory McIlroy's "Little Interviews"